Learn why pulling the plug doesn’t stop streaming with the Wowza ClearCaster appliance. Recently, I was supporting our CEO, Dave Stubenvoll, by providing an onsite customer demonstration of the Wowza ClearCaster™ appliance. Suddenly, right in the middle of our session, Dave intentionally pulled the 120-volt power cord from the unit. What I didn’t yet realize was that the Wowza ClearCaster device is designed to automatically resume streaming when power is restored. This incident, while terrifying, actually showcased the resiliency of our ClearCaster hardware, and how it can consistently recover from a power outage. 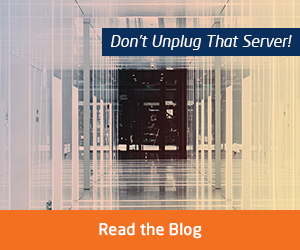 In most instances, removing power—or disrupting a physical server in any capacity—is a very bad idea. Candidly, even having witnessed the ability of our branded hardware to recover from loss of power, the idea of showing that off in an on-site demo makes me a little nervous. Most of us in the industry shy away from “messing around” with a server once it’s up and running. My friend, Richie Murray with Bridge Digital, would certainly disagree with me. Over a period of months, I had been running into Richie at various industry events, where he kept trying to get me excited me about a “fault-tolerant server” that he was convinced would be perfect for streaming. He claimed to have this device that would “keep on going” when any primary component became compromised during operation. Video streaming is complex and resource-intensive. The thought of a server maintaining a transcoding and packaging workflow—to a maximum scale—while losing a hard disk, power supply or motherboard component sounded very far-fetched to me. But then again, Richie is a stand-up guy, and I realized he may be onto something. I agreed to meet with Richie and his team to help them set up a test server. We established a simple transcoding workflow, using Wowza Streaming Engine™ media server software, and commenced testing the fault-tolerance of their device. The NEC Express 5800 fault-tolerant server is a 2RU device that is essentially two servers in one box. Every component of the device is perfectly replicated by a accompanying, redundant spare, resulting in two functioning, logical sections that operate as one. Interestingly, there’s no advanced configuration required, since it looks and feels like a single server—with the key difference that you can physically remove half of the server hardware while your video streaming workflow is running, and it doesn’t skip a beat. Impressed, but not convinced, I decided to up up the ante. I thought perhaps we got lucky with the fault-tolerant server handing a simple single-stream workflow; what will it do under a “real” video-streaming workload? Requesting time on the server, I scheduled another session to configure several internal source streams using the Wowza StreamPublisher. I also made sure the central processing unit (CPU), network and memory were all up to around 80 percent utilization, tasked with recording (MP4 and nDVR), heavy transcoding, and HTTP packaging into HLS and DASH. With the server under heavy load, I called Richie (snickering to myself) and asked him to compromise the device. It didn’t skip a beat. I don’t know how they did it, but NEC has built a device that will, in my opinion, function as an optimal solution to bolster an on-premise media server deployment where a single point of failure is a risk. Having helped countless Wowza users design redundant workflows, this architecture is perfect for a situation when multiple servers are not practical, but where a redundant server is required. What I like even more about this is the simplicity. The setup is exactly the same as a single server, but again, with the fault-tolerance engineered into the hardware itself. If you’re considering an on-premise deployment; have concern over a single-server point of failure; and don’t have the experience, time or resources to build out an elaborate failover workflow, consider the NEC solution, available from a Bridge Digital. Installing Wowza Streaming Engine was simple, and the outcome was exactly as expected. With plenty of resources for a standard streaming deployment, this is a fantastic hardware solution. Take it from me: I tried really hard to break it, using all the Wowza tricks in the book, and I failed miserably. Can’t ask for much more than that! Tim Dougherty is the Director of Solution Engineering at Wowza Media Systems, based in Golden, Colo. A user technology expert, with more than 20 years of experience in IT, network administration, video production, and project/program management, Tim serves Wowza by helping customers visualize and integrate effective streaming media solutions. Providing a safe and secure environment for patients, staff and visitors is top of mind for healthcare facilities. This commitment extends beyond physical safety and includes the information that they manage and safeguard. As healthcare organizations move more of their information and business operations to the cloud, cyber threats and unauthorized access become important security concerns. Patients, too, are concerned about their health information. Who has access to my sensitive data? Can I easily access it when I need to, without compromising security? Recent studies show that increased threats of cyberattacks have an adverse effect on business transformation, slowing innovation, increasing potential fraud and affecting the cost of doing business. A comprehensive approach of seamlessly integrating solutions to address IT, communications and collaboration, identity and access control will help healthcare organizations improve the safety, efficiency and reliability of their operations and service delivery. The healthcare industry is increasingly turning to biometric solutions to help combat not only fraud, but also medical identity theft. Research predicts that the healthcare biometrics market could reach $2.8 billion by 2021, with North America seeing the largest increase among regions. Fueling this growth are HIPAA and other regulations affecting the handling of healthcare data. Facial recognition can be used to ensure that only authorized healthcare staff get access to critical patient data, particularly when used as part of multi-factor identification. Facial recognition combined with either a passcode or key card helps make ID more secure. Administrative staff can more quickly process admissions and discharges by using biometrics for patient identity. Healthcare providers are able to access the right patient information when they need it. For patients, facial recognition gives them access their personal health information, reducing the chance for identity theft of healthcare records. Another application of facial recognition or other biometrics method (finger or palm prints, vascular palm/vein pattern, etc.) is patient identity within a healthcare facility. Secure identification improves safety and security, helps prevent errors and lets staff quickly identify allergies or pre-existing conditions in patients’ records in case of emergency. Things move fast in a healthcare facility — especially during times of emergency. Healthcare officials need a contingency plan to ensure the ongoing safety of patients, staff and visitors during a threat situation. Emergency notification solutions quickly communicate the source and severity of a developing situation and ensure an adequate response by both hospital staff and public safety officials. Privacy and protection of patient information is central to reputable healthcare organizations. The data must be secure, but easily accessible when needed. Comprehensive data management and storage solutions provide protection along with secure accessibility of patient data and information. Cloud infrastructure offers a reliable solution needed to support information-intensive workflows within a healthcare facility. A secure and resilient infrastructure is a suitable option for highly connected healthcare facilities and the dynamic caseloads they manage on a daily basis. A high availability infrastructure from NEC delivers a multi-tiered resilient environment that recovers quickly in times of disaster, by using Five 9s Fault Tolerant servers, disaster recovery software and SAN and Scale-out Grid Storage options. Check out NEC’s smart comprehensive healthcare solutions. Hey Buddy!, I found this information for you: "Power-Up Your Summertime Reading List". Here is the website link: http://nectoday.com/power-up-your-summertime-reading-list/. Thank you.